These choice seats on the ground floor of the theater run just 3 to 13 rows from the orchestra players and allow you an outstanding view and sense of connection with the conductor and musicians on stage. Either a modern elevator or stairs take you up to these top-notch balcony seats just 11 to 15 rows away from the orchestra players. These seats give you a grand elevated view of the musicians and the theater, particularly the extraordinarily decorated ceiling. Many of the seats in this section have the same direct view and sense of intimacy with the players as the Dress Circle seats, they are simply a bit further from the stage. Located just behind the Grand Tier, this section can be accessed by modern elevator or stairs, and offers an overview of the entire theater while being only 16 to 20 rows away from the musicians on stage. This area has the same superb acoustics that the Grand Tier enjoys. This section shares the same proximity to the stage (just 1 to 20 rows away) as other sections of the hall. Like the rest of the Mezzanine section, these seats afford an elevated view just 16 to 20 rows away from the musicians on stage. The seats on the main floor, in all price categories, from the side Orchestra level doors forward toward the stage are all reachable with absolutely no stairs. The elevator in the box office corridor will lead you directly to this level of the theater from either lobby. All of the theater's wheelchair seating is also in this area. 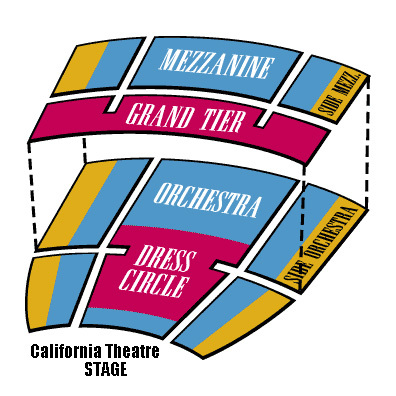 All other seats on the Orchestra level, with the exception of the very last row, require between one and six stairs to reach. All seats on this level will require at least one stair to reach. Seats in the Grand Tier require fewer stairs than seats in the Mezzanine and Side Mezzanine seating areas. While there are seats designed to be ADA compliant on this level, the Symphony prefers to seat those who cannot, in an emergency, navigate the theater's stairs on the Orchestra level instead. This is because the building's elevators stop running during a fire, leaving wheelchair-bound patrons stranded in a life-threatening situation.